The theme park woes that have been affecting the UAE in varying degrees recently have continued with the announcement by DXB Entertainments that the planed Six Flags Dubai project “cannot proceed”. The decision comes after a strategic review of the future development plans and capital deployment for DXBE in August 2018 which included development of the park. 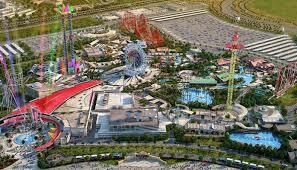 A statement read: “In the intervening period, actions, including formal notification by Six Flags, resulted in funders’ concerns being raised specifically in relation to the revised projections for the Six Flags Dubai Project. As a result, the syndicated finance facility intended for utilisation as part of the development of the Six Flags branded theme park is no longer available, and the Six Flags Dubai project cannot proceed at this time. DXBE, formerly Dubai Parks and Resorts PJSC, operates five theme parks including Legoland Dubai, MotionGate Dubai and Bollywood Parks Dubai. It also manages some of the Meraas owned leisure and entertainment offerings in the region such as Hub Zero, Mattel Play Town, The Void and Roxy Cinemas.